Hot weather favourite from 1984? This skirt with fly front and pockets is described as Fashion that Fits on the pattern envelope (McCall’s 6361). It does fit but I’m not too sure about the fashion, exactly. Stella McCartney has nothing to fear. As usual I messed up inserting the zip when following the pattern instructions. To me, there seems to be a step missing. Maybe it’s me! Also the waistband instructions didn’t correspond to the waistband pieces. I also didn’t understand why you had to add ease at the top of the skirt because I just ended up with a fullness at the waistband that looked wrong. Good things? The skirt has turned out to be really useful and comfortable. I liked the little extra tips throughout the instructions. Bad things? 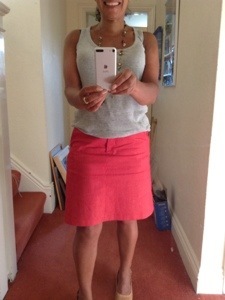 The skirt is actually quite short and the usual alteration I make for my height made it on the verge of being a mini. The pockets are a bit nippy. They’ll take a phone but only just. The design is quite dated in its style as the waistband comes up very high. I’m not sure you’d find a RTW skirt with such a high rise these days. Fabric Used: Stretch Cotton polyester with 3% Lycra from John Lewis (half price in the sale). I had only bought 70cm and this turned out to be just enough, if only because the pocket and waistband facings were made in a different fabric. I will sew it again and would definitely use stretch fabric. I would also use the very good advice about improving the pocket instruction that you can find here: http://the-diligent-dilettante.blogspot.co.uk/2012_08_01_archive.html. 18 Jul	This entry was published on July 18, 2013 at 12:51 pm. It’s filed under sewing and tagged McCalls 6361. Bookmark the permalink. Follow any comments here with the RSS feed for this post.